This is a “factual” review of the 3 days I spent observing the Burro round up, processing and adoption. In attendance were several BLM EEs, Cattoor Livestock Round Up, Inc. and their EEs, myself, one additional Wild Horse and Burro advocate (she does not want her name released), and Tom Seley did stop by for a short time. The round up itself was completed all in one day, Monday, 03/05/12. From 8:30am to 4:30pm with the use of a helicopter and wranglers. The first trap site was 6 miles from Beatty up 95N on the east side of the hwy. on or behind private property. 51 Burros were captured in 5 groups from 8:30am until about 1pm. 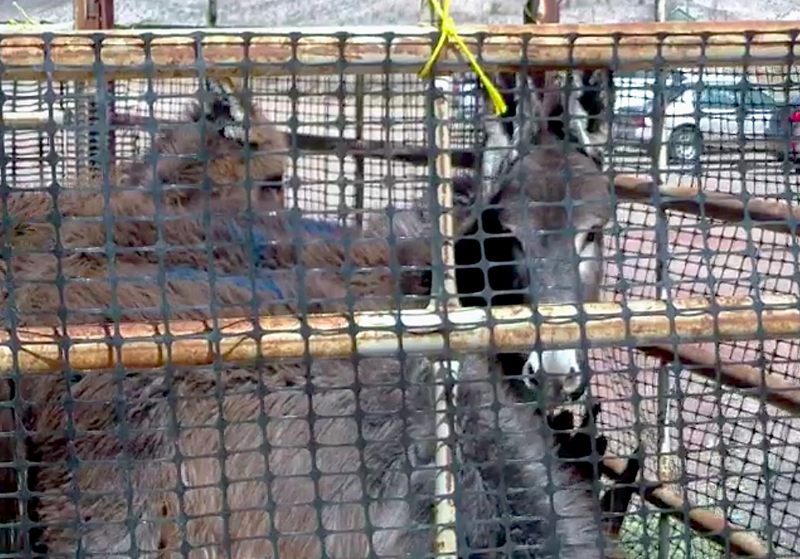 I had a good view of the trap and the loading of the Burros into the trucks. I could not visually assess the respiration rates of the Burros (which is the most basic way to assess stress in equines); therefore, from my limited ability to assess, I did not see that they sustained any injuries. In addition, I did not see anything I would consider an official animal cruelty violation in the process. They were all transported in trucks to the corral at the front of the property, about a 3/4 mile back from the highway. It was not possible to see the corral from the highway with the naked eye. The second trap site was 3miles back towards Beatty on hwy 95 South, also on the east side of the hwy. 26 Burros were captured in 2 groups from 3:15pm until 4:30pm. I was not provided a visual of the trap or the loading. I was only able to view the Burros running in the direction of the trap. (strong opinions not provided to the point of indigestion) The 26 captured at the 2nd site were transported back to the original site and also placed in the corral. Water and grass hay was provided for all of the 77 Burros. They were taken from the desert in good physical condition. On Tuesday, 03/06/12, the processing of the Burros was completed. (This is where the Jacks are separated from the Jennys and yearlings.) Random samplings of hair and blood were taken for testing. 8 yearlings were chosen and transported to a separate corral to be readied for the adoption. They were freeze branded, vaccinated, had blood drawn to test for coggins and each had a number spray painted on them for identification. On Wednesday, 03/07/12, the adoption started at 9am. No signs were posted on the Hwy 95, in or out of Beatty, and the pen was not at all visible from the road. Not one person showed up. Only two of the yearlings were adopted, both by the Wild Horse and Burro advocate that attended the round up. This advocate had left Beatty on Tuesday, but drove 1 and ½ hours back to the site the next day when she found out no one had shown up to adopt. Her main concern was for the tiniest Burro, which she did adopt along with another male. Both of the adopted Burro yearlings are now adjusting to life in their new home. The additional 75 Burros were transported to a holding facility called Ridgecrest Regional Wild Horse & Burro Corrals @300 S. Richmond Rd. Ridgecrest, Ca. 93555.